Loaded with digestive enzymes, amino acids and beneficial bacteria, Green Tripe has enormous health benefits for your canine or feline companion of all ages. Fed daily in addition to your pet’s meals or given as a daily treat, Green Tripe is an essential part of maintaining excellent pet health. 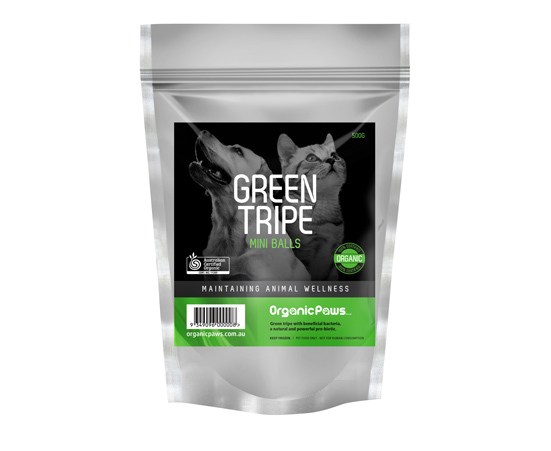 Our green tripe contains naturally high levels of beneficial bacteria, vitamins and abundant other essential nutrients. Its unique health-enhancing properties help to boost the immune system, purify the blood, and help remove harmful toxins and parasites. Fed daily also helps to balance hormones and enhance liver function, increase energy and vitality levels and enhance overall longevity. Perfect to help pets recover from digestive problems, skin conditions, poor gut and chronic ill health. Freshly frozen Green Tripe Mini Balls available in 500gm lock seal bags.